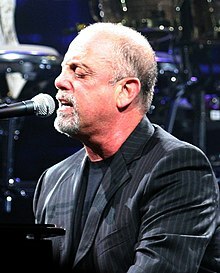 William Martin "Billy" Joel (born May 9, 1949) is an American singer-songwriter. He produced successful pop songs for two decades, from 1973's Piano Man to 1993's River of Dreams which marked his retirement. As well as writing classical music, he has frequently been on the road, usually with Elton John. He is a Democrat. In 1988, Joel played a New York City dog named Dodger in the Disney animated movie, Oliver & Company. Joel has been married four times. The first three ended in divorce. His first marriage was from 1973-1982. His second marriage, from 1985-1994, was to supermodel Christie Brinkley. Their daughter, Alexa Ray Joel (born 1985) is one of his two children. His daughter's middle name is taken from one of his musical influences, Ray Charles. His third marriage began in 2004. His fourth marriage with Alexis Roderick began in 2015. They had one child; Della Rose Joel, who was born on the 12th of August 2015. ↑ Billy Joel Biography. billyjoel.com. Retrieved on December 7, 2008. ↑ Edmondson, Jacqueline (2006). Condoleezza Rice: A biography. The United States: Greenwood Publishing Group. p. 22. ISBN 978-0-313-33607-2. ↑ "Billy Joel's campaign donations". NewsMeat.com. Archived from the original on October 15, 2012. Retrieved December 8, 2008. This page was last changed on 4 May 2018, at 13:56.